Rep. Dana Rohrabacher, R-Calif., seen in 2013, stands out in the Republican Party for his urging of closer ties with Russia. Under the cloud of investigations over Russian meddling in American politics, he's being challenged over that stance in his re-election campaign. The Russia investigation has shown few signs of having an impact in this year's congressional elections, but there's a House race in Orange County, Calif., where Vladimir Putin looms large. In fact, the congressman running for re-election there says he once arm wrestled the Russian president. Rep. Dana Rohrabacher easily stands out as one of the most pro-Russia voices in the Republican Party. During the 2016 campaign, Politico called him "Putin's favorite congressman." The New York Times reported that Russia viewed him as an intelligence source, even giving him a Kremlin code name. Rohrabacher's story about arm wrestling Putin involves a few rounds of drinks in the 1990s and settling an argument over who won the Cold War. Members of Congress and those hoping to become members of Congress are generally more focused on bread and butter domestic issues — such as health care, the economy and the environment. But Rohrabacher is different. Opponents on his left and right are leveraging his long-standing calls for closer relations with Russia as one of the primary issues in their campaign, now that Russian attempts to influence American politics are a flashpoint. Rohrabacher has two Republican challengers this cycle. One is a pro-Trump Republican who is running to defeat the California Republican on an anti-Russia platform. "He's advocating a relationship with Russia that I think, it's dangerous for the United States," said Stelian Onufrei, a local businessman in California's 48th Congressional District. "I don't believe necessarily that Russia is our friend, and I don't think that Russia will ever have anything that benefits the United States." An immigrant from communist Romania, Onufrei arrived in America nearly penniless and spent years working to establish and grow a construction business. And he sees parallels between his experiences during the Soviet occupation to the way the Russian government functions today. "I lived under communism. I know what communism tastes like, feels like, smells like — because I lived it," Onufrei told NPR. "It was very naive of us to believe because Russia was down and broke [when the Soviet Union collapsed] we thought they're out. Well, they were never out." Rohrabacher is also being challenged by a representative of the anti-Trump faction within the Republican Party. Paul Martin, another lifelong Republican, heads an organization called the Christian-Muslim Alliance. He makes Rohrabacher's stance on Russia the central talking point for his campaign. "He's embroiled in Russia. His loyalties are to protect Vladimir Putin from having sanctions imposed on him from our Congress," Martin said. "The revelations of his long term relationship with Russia will be coming out. Dana Rohrabacher is not fit to represent the people in this district. I hear about it every single day. I hear about it from Republicans. He is not fit to be the representative of our district any longer." His opponents on the left also view Rohrabacher's views on Russia as a vulnerability. Harley Rouda, a Democrat challenging Rohrabacher, is having his campaign distribute a sticker that reads: "Piss off Putin — vote Harley Rouda." "At best, it's stupidity because it's not doing anything to drive a greater, stronger economy," Rouda said. "And from a nefarious standpoint, the question is why are you spending so much time on Russia when there's so many more important things you should be working on?" Rep. Adam Schiff, the top Democrat on the House investigation into alleged links between the Trump campaign and Russia, is generally urging his fellow California Democrats to campaign on college affordability and how to respond to the economic challenges of globalization and automation. Not with Rohrabacher's district, which he views as peculiar. "The Rohrabacher district is probably anomalous, because there the congressman has taken a very visible role in promoting good ties with Putin," Schiff said. "So I think that is an important issue in that district, but that's probably one of the exceptions." Rohrabacher, reached by phone while on a trip to Paris, defended his stance on Russia. "It's legitimate to think that I'm vulnerable on that, because they're wrong, because they're listening to the fake news, as well. 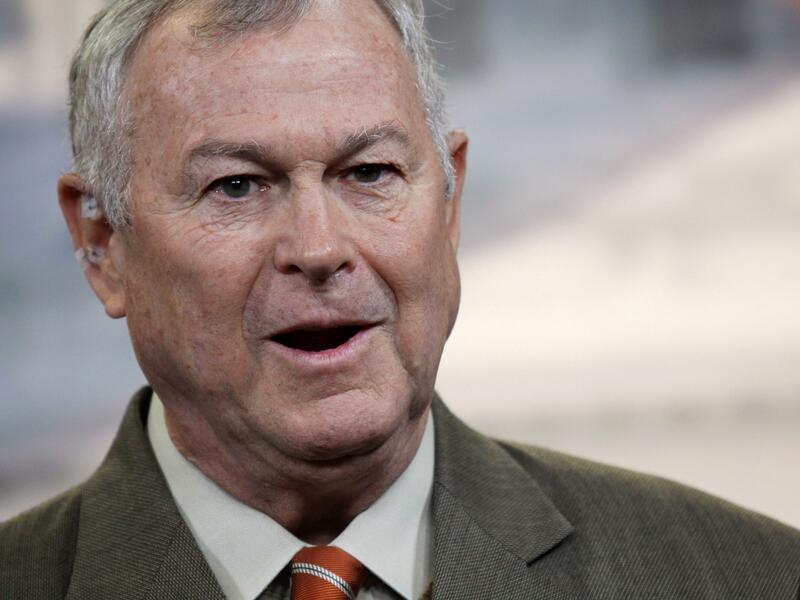 My opponents are taking advantage of that," Rohrabacher said. His meeting with Russian government officials over the years — and his interest in closer ties with Russia — are a legitimate part of his work, Rohrabacher insists. "I'm the chairman of the foreign affairs subcommittee that has jurisdiction over Russia, Europe and other parts of the world," Rohrabacher told NPR. "That I would ever meet with Russians, Ukrainians or anybody else is understandable and legitimate." Orange County is not the place in America where you'd expect to find a congressman so focused on Russia. The district, which includes a long stretch of California coastline and some of southern California's most charming beaches, has almost no Russian population to speak of. Out of nearly three-quarters of a million residents, only about 11,000 have Russian ancestry, according to the Census. In fact, California's demographics have been changing pretty dramatically over the past several decades, with the state becoming more Democratic-leaning. "California has changed. Republican registration over the last two decades has dropped about 12 points," said Jim Brulte, the chairman of the California Republican Party. "The drop tends to parallel the decline in the white population in California. Orange County is not immune from those demographic changes but they're one of the last counties to feel the full effects of the demographic changes." Critics say Rohrabacher has benefited heavily from incumbency — that many constituents just check the box, without knowing much at all about him. "A lot of women that I've talked to think, 'Hey, she's doing a great job. Why should we throw her out?'" said Laura Oatman, a Democratic candidate running against Rohrabacher. "And I have to very politely and kindly correct them and say, 'Well apparently you don't know too much about Dana Rohrabacher.'" There are signs that Rohrabacher's district is moving leftward — in 2016, although Rohrabacher won reelection, Hillary Clinton bested President Trump by nearly 2 percentage points in this district where Mitt Romney had beaten then-President Barack Obama by 11 percentage points in 2012. Omar Siddiqui, a Democratic candidate in this race who is running on his work with the FBI, says it's an ominous sign for Rohrabacher. "Orange County is changing significantly for the first time since Roosevelt. You have a district that went blue Hillary Clinton over Republican Trump, and that is significant that is indicative of a blue wave coming for sure," he told NPR. The polling bears out Rohrabacher's vulnerability: A poll taken last month by the University of California, Berkeley, revealed that 51 percent of his constituents are not inclined to re-elect him.